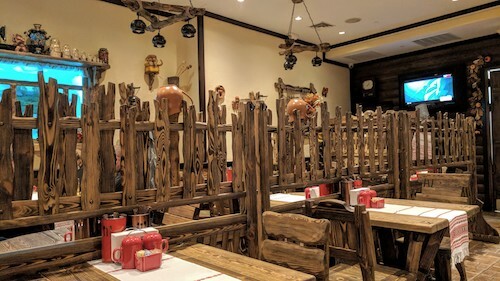 The surroundings may feel a little familiar when you walk into this new Belarusian restaurant for the first time. The lobby, the bar, the elevator between floors, even some of the wall decor reminds you of somewhere you have been before. 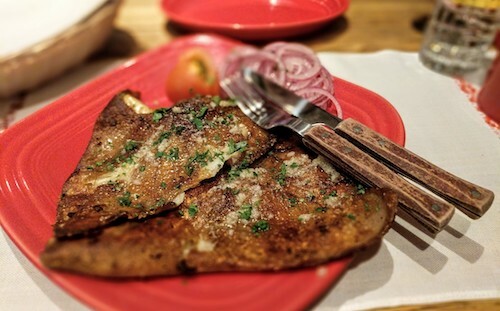 The cuisine will convince you that this is your first time though, as Belarusian offerings have been on hiatus from New York City for a few years since the closing of Syabri on Kings Highway. The space, and those memories you could not quite put your finger on, were formerly Cafe Glechik, a mediocre Ukrainian restaurant that took over this address and brand new construction. The two floor restaurant has now taken on the cuisine of Ukraine's northern neighbor Belarus, and stepped up its game to the nth degree. This is actually the second branch of Belarussian Xata in the world, the first lives in Moscow. 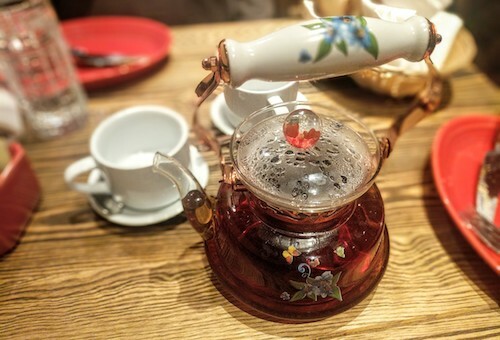 Those triangular-shaped guitar-like instruments and accordions might be hand-me-downs from Cafe Glechik, but all the new rustic furniture and decor is new. Along with the red and white dress of the staff, it tries to present a traditional, possibly country setting in Belarus. The staff is very friendly, and happy to answer your never ending questions about the foods which are unfamiliar. 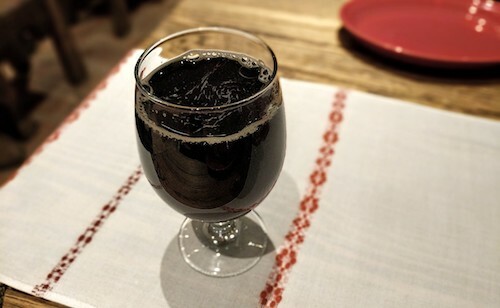 Order a glass of Belorussian kvass ($2.50, above) or a black tea pot ($4, below) to quench your thirst while you peruse the full menu. Surprisingly, the place has a full bar, although we did see a couple groups bringing bottles as you often see in Brooklyn Eastern European restaurants. 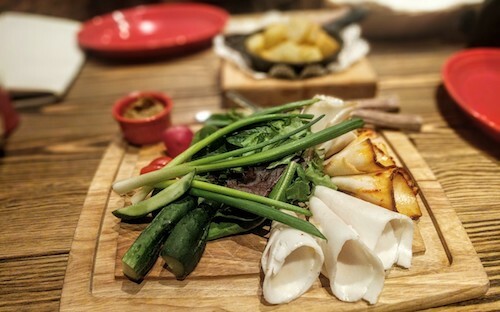 Many menu items overlap with Russian food, as expected and similar to Ukrainian and other former Soviet cuisines, but there are standouts and you can ask which are more specifically Belarusian if that is to your taste. 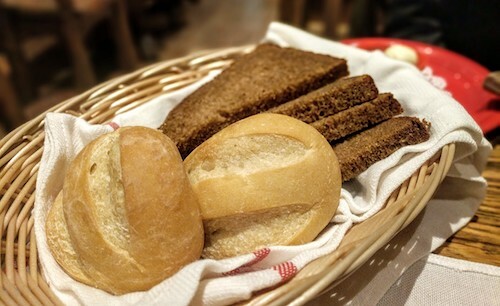 Thankfully, a basket of bread shows up and includes sour rye, which any Belarusian table should include. 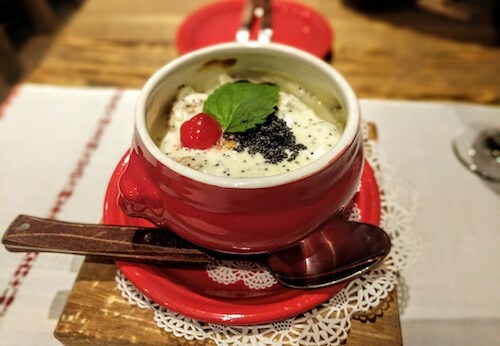 While our meals were shared and we opted not to get soup, the place seems to excel in them, with a special mushroom soup being seen most served in a bread bowl. As if it were the most popular dish, our waitress showed us a beautiful photo of the herring "village style" ($7, below). Both of us passed glances about how we felt about herring, but decided to give it a try anyways. 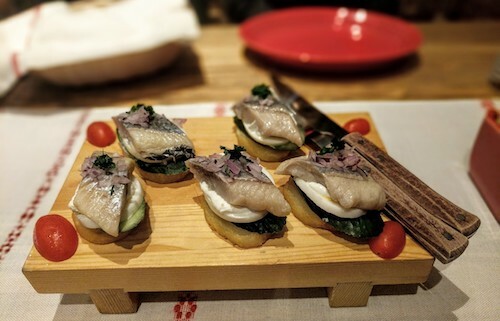 Lovers of herring should enjoy this open-faced sandwich of sorts, with a fried potato as the base with cucumber and egg to accompany the fish. Staying with the village theme, a plate of appetizer "village style" ($15, below) was ordered on a second visit. This is a selection of three different types of salo, cured slices of fatback. 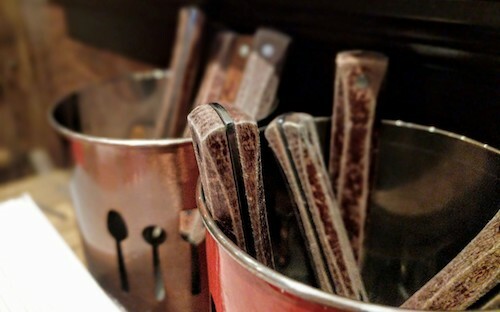 Keeping with the visuals of the restaurant, both items were served on wood whether it be tray or cutting board. The salo is served with really nice fried potatoes and spicy mustard. Use bread and/or potatoes with each bite of salo for the best experience. Also recommended was the fried hog's ears ($12, below), which when agreed to the waitress giggled and gave us a look of real pride. Two whole ears come out deep fried with generous amount of garlic. This really gives you the opportunity to enjoy the hard cartilage of the ear, but it could have used a side of pickles or something to break the texture up a bit. 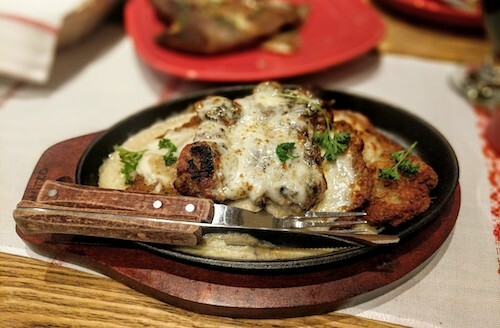 There is nothing more Belarusian than machanka ($16, below), a thick meat gravy served with pork sausage and ribs. You can have this served with potato pancakes, but the thin blini were our choice on this already heavy meal. First rate. The source of our potato pancakes, or draniki, was one of many options under the "Belarussian Specialties" section. Potato pancakes with pork ($14, below) sounds innocent enough, but comes with a very thick piece of meat and is covered in cheese sauce. The pork is very well marinated, and this dish was well received. 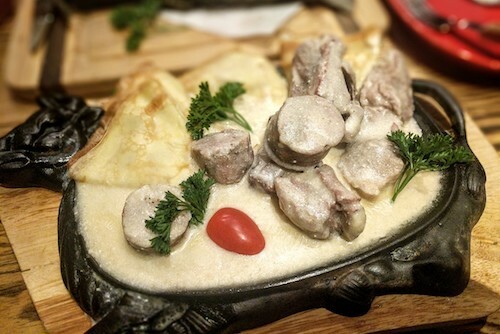 Typically, Belarus does not have so much access to seafood and this is seen in the cuisine. 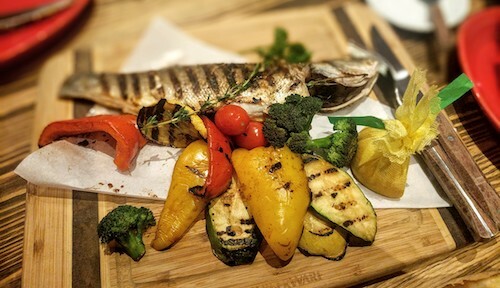 After so much pork, a little fish was absolutely necessary and initiated an order of grilled branzino with vegetables ($21, below). The chef did a great job with the cooking of this, and flaky hunks of meat were singed with rosemary. For dessert, do not let the opportunity slip by to try the mini cheese balls "Orshanskie" ($11, below). These balls of cottage cheese are smothered in a sauce of sweetened sour cream and topped with poppy seeds. It comes hot, and is an amazing end even when you think your stomach is past the point of accepting more. A very warm welcome back to Belarusian cuisine in New York City. Go see what you've been missing and tell us what you find that we did not try.